As the automotive industry gears up for self-driving and connected cars technology transfer into the market from other areas is accelerating innovation. 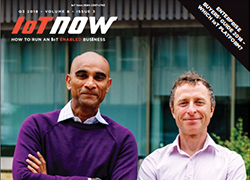 Neural networks, sensor fusion, robust networking options and heightened security will enable connected cars to offer more automation, Lars Reger and Juergen Weyer tell IoT Now. Robin Duke-Woolley, the chief executive of Beecham Research, met Thomas Seiler, the chief executive of u-blox, a provider of wireless semiconductors and modules for consumer, automotive and industrial markets, at the CTIA show in September 2016. They discussed emerging low power wireless technologies, the direction of the industry and u-blox’s future plans. The IoT offers such a wealth of opportunity that you need the courage to work with others in order to move faster, argues one of the industry’s leading lights, Drew Johnson, vice president of engineering at California-based service provider Aeris. Report by Nick Booth, freelance IT & communications writer. Telenor Connexion is making a major play in the Internet of Things data analytics market, with the launch of a platform that makes sure IoT networks do the things they are supposed to do, Antony Savvas finds out more. Tom Rebbeck, research director at Analysys Mason, talks to Mike Troiano, Vice President of IoT Solutions at AT&T, to discuss how AT&T is supporting the Internet of Things (IoT) from providing connectivity through to end-to-end solutions. The design of Internet of Things (IoT) solutions are strongly context aware, service-oriented focused, and multidisciplinary. There have been several predictions about the increasing number of connected devices but, regardless of the disparity, it’s clear the move is towards fully connected contexts. What is eUICC and why is it important?